Everyone has their quirks. It's part of being human. I'm sure my quirks would need more than two hands to be counted on. But you shouldn't feel the need to apologize for who you are. And if anyone tries to change you and train you, as if you're their pet instead of a human being, please don't think that there is something wrong with you. If someone can't accept you for the person you are, then that's not a healthy relationship and it's not something you should have to put up with. 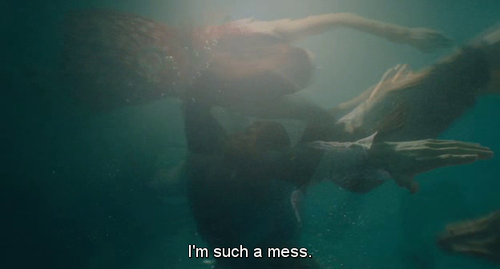 I watched the movie "Ruby Sparks" last night -- a movie about an author who makes up a fictional girlfriend who then comes to life. And, when the girl does something he doesn't like, he goes to his typewriter, and he changes her. Yet, when he tries to change her, their problems only get worse. That's because people aren't your own personal Barbie doll or, in this case, your own character in your own personal novel. People are unpredictable. And that means, sometimes, they disappoint you. The main character's brother Harry says about his wife, in one of my favorite lines, "I love Susie, but she's a weirdo." He says this in an attempt to tell his brother Calvin that love isn't perfect and, living with someone day after day, you see their quirks. You see how weird they are. That's real life. I think there's beauty in imperfections. Accept these things about yourself, because no one is perfect. Anyone who tries to change this about you isn't worth your time. And, I can guarantee you, that the person who is trying to change you definitely isn't perfect either. Never settle for anything less than someone who loves you for how weird you are. this is so true! So many times people try to change to meet the expectations of others, that never works. We must be true to ourselves and you are soooo right, we are ALL weirdos! !